Dealer Media Australia’s strong presence in the industry allows our network of sites to engage with users to deliver powerful media and marketing solutions for our corporate partners. With our dynamic content and highly-targeted audience we give you creative opportunities to reach and engage with thousands of potential customers. We develop impactful ad formats, creative and branded content and work to deliver intelligent media solutions which match your advertising objectives. 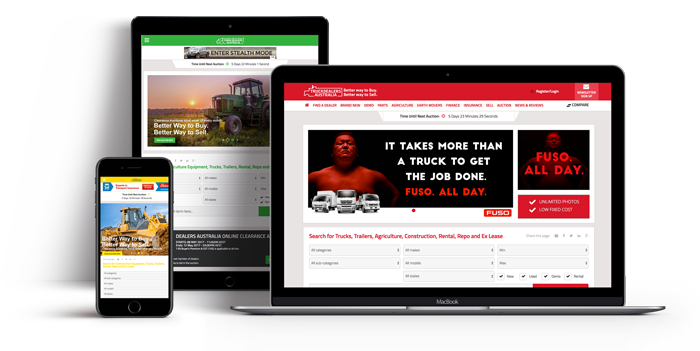 Our network offers users trusted sites where they can find the latest trucks, trailers and heavy equipment for sale from many of Australia’s leading dealers. With our network of sites growing at a rapid rate, we’re positioned to provide our partners with an outstanding precision-targeted advertising solution that will reach their advertising objectives. We offer advertisers numerous touchpoints throughout a user’s journey to influence and engage with our audience. We work with our corporate partners to produce creative and flexible advertising solutions that deliver maximum reach to target audiences. We optimise our advertising channels to deliver qualified audiences resulting in minimal wastage of marketing spend. Our audiences are socially active, and are quick to share information of interest to their friends and industry colleagues, giving you an extended reach. Every month, our corporate advertisers receive a comprehensive report detailing their brand’s interactions with our audiences. We reach 150,000 engaged users monthly, resulting in an ability to implement promotional campaigns in a highly interactive and engaging way.